One intrepid reporter's quest to learn everything there is to know about hangovers, trying all of the cures he can find and explaining how (and if) they work, all so rest of us don't have to. We've all been there. One minute you're fast asleep, and in the next you're tumbling from dreams of deserts and demons, into semi-consciousness, mouth full of sand, head throbbing. You're hungover. Courageous journalist Shaughnessy Bishop-Stall has gone to the front lines of humanity's age-old fight against hangovers to settle once and for all the best way to get rid of the aftereffects of a night of indulgence (short of not drinking in the first place). Hangovers have plagued human beings for about as long as civilization has existed (and arguably longer), so there has been plenty of time for cures to be concocted. But even in 2018, little is actually known about hangovers, and less still about how to cure them. Cutting through the rumor and the myth, Hungover explores everything from polar bear swims, to saline IV drips, to the age-old hair of the dog, to let us all know which ones actually work. 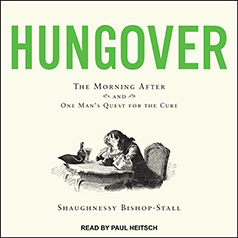 And along the way, Bishop-Stall regales listeners with stories from humanity's long and fraught relationship with booze, and shares the advice of everyone from Kingsley Amis to a man in a pub.